So this month's Random Recipes organised by the wonderful Dom at Belleau Kitchen, is an easy, if a little (for me anyway) embarrassing one. Keep reading and you'll understand why I say that. 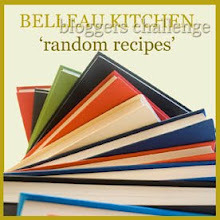 Dom kindly gave us a break this month from the usual format of Random Recipes - which is to randomly select a cookbook from your collection, randomly choose a recipe, and then cook it and blog it. Yes, this month, Dom decided that he wanted to see our cookbook collections. I think this will make for a pretty interesting round up come the end of the month! Hello, my name is Susie and I am addicted to cookbooks. There, it's firmly out there now. I wish I could say that last photo shows the extent of my addiction. But there is more. The book shelves you can see have gradually made their way down the wall over the last 10 years. The shelf above the dresser was an overflow 'solution' when Mike firmly said that I could not have any more on the wall, as the boys would bang their heads on them whenever we sat down to eat. But when I ran out of space up there, we somehow managed to squeeze in one more shelf to take my baking books, which I wanted to organise into one row. And the rather higgledy pile? That used to be on the top shelf. When we had the kitchen refitted back in March, we also had some new lighting and a lower ceiling put in the dining area. The ceiling dropped only by a few inches, but it means that I can't get the top shelf of books back up there. I could get some, as I could lay them flat rather than stand them up. But that would mean I'd have to choose which to put up there. And I can't face that prospect yet. I mean, I'd probably then have to get rid of some of them as I think the house really is getting to the point that it can't take any more. Perhaps Mike, too. Love him, he's tried to institute a 'one in, one out' rule. But that, to me, is missing the point entirely. It's silly perhaps, but I love reading cookbooks. I first began collecting them over 25 years ago, when one of my first jobs while I was a student gave me access to the joys of a WHSmith staff discount, and a book department. There are also quite a few charity shop finds I discovered. Then someone invented Amazon, and my access to a whole new world of cookery books kicked up several different levels. I know it looks a lot. But there is some sort of order to this chaos. And I do read them, cook from them, and, for most of the time, I know pretty much exactly what I have and where. And somewhere in the back of my head, I am aware that it looks pretty crazy. I mean, all this obsession about food. But there you go. That's me. Anyway. I hope you have enjoyed this peek into my obsession. I must admit, I've enjoyed peeking at everyone else's. OH. MY. WORD! What an impressive collection! I'm surprised your brain doesn't just explode every time you want to bake, so many books to choose from! Delighted to see I'm not alone in my addiction. And yes, I read them - I love to read recipe books properly, like novels, too - especially ones written by Elizabeth David and Nigel Slater. I'm not ready to reach for the phone and dial that hotline yet, Dom! Hi Jane - thank heavens I'm not the only one! I love Nigel Slater, too. I love the tales that wrap around recipes and give you that insight into the author, place, culture etc. Mike has definitely got the patience of a saint on occasions! Oh my goodness, I've never seen so many cookery books! Do you find that you dip in and out of different ones, or mainly use the same few over and over? I know the feeling though, I love to buy cookbooks to read and just to have, even if I only ever make one recipe from them! And I've only been cooking for 10 years (since I left uni) and have got about 75 books so at this rate might catch up...! Wow, I thought I had a substantial collection but I see I have a long way to go! This is good news for me and I've just shown your collection to my husband who previously thought there were no more cookbooks to buy. It must be lovely when you want to cook something - kettle on, books out, cup of tea and brrrooowwwsse. The perfect day! Thank you for sharing (although my husband might disagree!). In my experience, *winces*, there are always more cookbooks to buy. I really must learn to curb my internet habit. Between Amazon and the Book Depository I could spend hours browsing. And you're right, there is nothing like curling up with a cuppa and a pile of books and losing myself for a few hours. Well, I've got to admit that's a lot of books. However, I believe that the latest research using the Large Hadron Collider has categorically proved that the concept of too many cook books is not valid. I'm not sure how you find the book you want when you suddenly remember that you've seen a recipe for a particular dish somewhere or other, but I bet it's fun trying. Wow - you're the first person I've seen who's collection looks like mine. It is an obsession, isn't it? I have no intention of seeking a cure...ha ha ha! I'm envious - I'd love to have the space to have purpose built shelves! Mine have evolved over time and are just basic Ikea shelves. I'd love to be able to sort them into categories properly, but they are a bit all over the place - apart from my baking books which are on the bottom shelf. I've filled that now, though, so am always trying to scrounge space elsewhere. If I were to be addicted to any kind of book, it would be cookbooks. All the pictures, stories, warming thoughts, and yummy things to eat. However, if I had your collection, I think I would be paralyzed by choice! Trying to pick just one thing to make would feel impossible. I am amazed at your collection. Yes, I know what you mean. When I am looking for something particular and there are a number of options it can be a bit 'rabbit in headlights' trying to decide which one to go for :) . But I also like to go by the look of a dish, and the description, so if something takes my fancy I'll give it a go. Waaaaaa! And yet, the most staggering thing, even on that huge bookshelf photo, on my tiny iPhone screen, nigella KITCHEN still leaps out. As I've said in other RR posts, the designers of that book cover deserve a medal! So lovely to meet another addict!! I know how you feel as I am exactly the same! Fantastic collection - has been so much fun looking at everyone's varying bookshelves. I thought I had a lot until I came here!! What a wonderful collection. I too am addicted to cook books, to tell a little secret, I have an open Amazon window on my computer at the moment and any books I am spotting on peoples shelves that I've been meaning to get I'm adding to my wish list!! Yes, I do have some favourites but rather than say here, I think I'll do an update on the post, as I really should have included something along those lines. Hope to do that over the weekend, so watch this space!Otherwise, I do love discovering new recipes,and usually I've been led to buy when'grabbed' by a couple of recipes browsing a book. Or there will be something about the 'feel' or design of a book as well. I guess that's why, although I love my Kindle, I don't think I could ever envisage buying a cookbook in anything other than hard copy. Yes I do count them every so often. Your comment has made me do so again this morning - and it coincided with the arrival of my latest purchase (the new Great British Bake Off 'Showstoppers' book - which looks fab!). Sooo - that one included there are 622. Yikes! Hope Mike doesn't see this! And, probably even worse, 151 of them relate specifically to baking, pastry, chocolate etc.